Review: "Proof of Innocence" is certainly not an inventive thriller, but one that knows how to sell its strong points. The good actors and an interesting tone, swinging back and forth between humor - the film doesn't always take itself serious - and despair, particularly need to be pointed out. After all, an all powerful enemy has to be beaten. Furthermore, there is a convincing hero, who actually isn't one and only gets the case by accident and misjudgment of his character. Granted, this put aside the end result may seem rather generic, but there are constantly new developments in the case which manage to keep the events thrilling. Characterwise no one really changes into a better person either, but the different personalities are interesting enough for us to share laughter and tears with them. Pil-jae seems like someone who really deserved his suspension from police work. He is often violent and only thinks of himself. His nature even created problems for his grandfather and moreover the background story around his father shows that there are a few demons he needs to conquer. He ultimately agrees to the case in order to take revenge on his former partner. Therefore, we have a hero who does the right things for the wrong reasons. Accordingly, Pil-jae isn't really loathsome, because he actually never truely keeps it a secret why he does the things others consider to be good deeds. It just happens that the lawyer is always misunderstood. Thus, he is also somewhat of a tragicomical individual which fits perfectly into the movie's tone. That tone turns out to be rather lighthearted in the beginning, yet also walks a darker path later on. "Proof of Innocence" also manages to be so thrilling because we can constantly see how an all powerful enemy, the chairwoman of a Chaebol-company (a family company that has political influence, too), puts obstacles in the heroes' way. And this can at times even become dangerous to life and limb. Director Kwon Jong-gwan ("Sad Movie") manages very nicely to make us doubt the mandatory happy ending every now and then. The dark moments in which the father sees no other option, but to either rot in his cell or take his own life are captured too convincingly for us not to be captivated by them. And even the daughter isn't spared and becomes a target of the villains. So maybe not everybody will survive after all. For us to actually think so is something the movie deserves some credit for and naturally it also raises the tension bar. 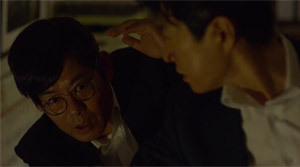 This is also what distinguishes the movie from let's say "The Advocate: A Missing Body", which it in fact shares quite a lot with. "Proof of Innocence" is very thriller-heavy and more than the characters it's the search for evidence that stands in the foreground. Unfortunately, pieces of evidence are sometimes found by mere luck. This looks cheap and surely doesn't make the screenplay come across as one of the genre's smartest. Yet, the director doesn't miss the chance to let the individuals occasionaly have their moments. Therefore, the thriller works so well especially since the individuals all look human, maybe apart from the female villain. Moreover, Kim Myeong-min ("Pandora") is the ideal hero as he isn't simply the good guy, but in fact has some traits of an egoistic guy, who actually could be one of the lawyers who takes bribes instead of giving them himself. 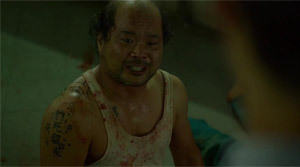 A true enrichment for the movie is Kim Sang-ho ("Ordinary Person"). He delivers an impressive portrayal as a father, who has been sent to prison although he is innocent and wants to prove this to his daugter. A role that has been played in Korean movies countless times, but Kim gives it a lot of color and turns this supposed supporting role into one of the lead roles. Particularly, during the countless flashbacks he manages to give his relationship with his daughter, also fantastically played by Kim Hyang-ki ("Thread of Lies"), some real depth. Therefore, his dramatic moments work out pretty well, too, and we are emotionally enganged by the story. There are also a few action scenes, in which the protagonists have to fight for bare survival, and they also work out quite well. In the end, you shouldn't expect an extraordinary thriller. Nothing is truely new here, but it's enough to be pleasently entertained without having to work yourself up about any flaws in the movie.